Hidden in the jungle BONECRUSHER can vent his rage on the rain forest. 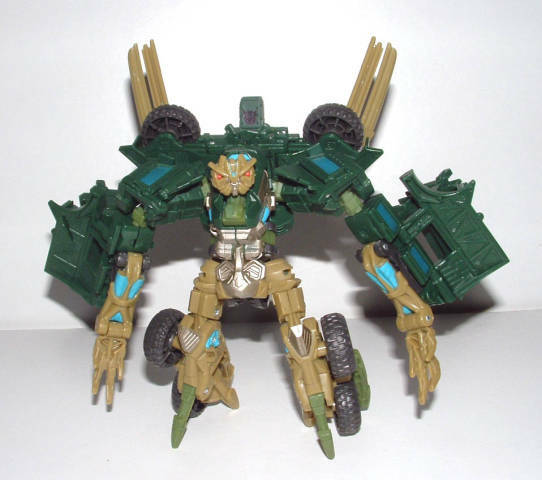 Ever since I saw the motorway scene in TFTM I�ve wanted a Bonecrusher and I got my Jungle Bonecrusher whilst I was part of my colleges backstage crew for the rock challenge dance contest. I popped out to the TRU handily located opposite the venue on my lunch break and grabbed this after finding no ordinary Bonecrushers. 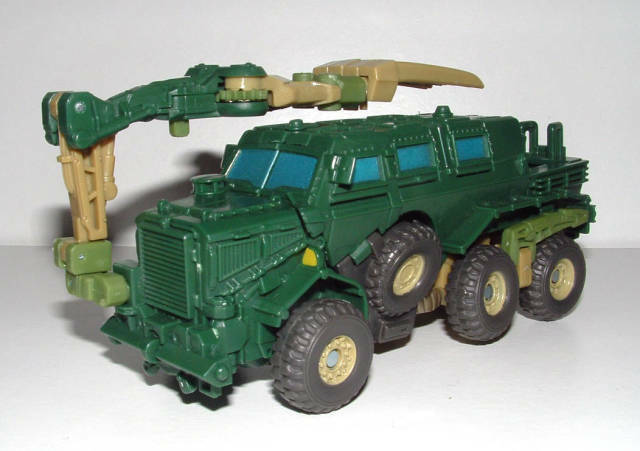 Jungle Bonecrusher is a Buffalo mine protected vehicle (M.P.V) which is apparently used for clearing mines. Now Bay, in his infinite wisdom, was under the impression that this machine used for delicate task of clearing mines had a massive claw on the front after seeing a cleverly angled picture, (in reality the claw is about 14 inches across) fortunately a giant crushing claw works rather well on a giant killer robot. The main colour here is green, lots of green and seen as he lives in the jungle its a good idea I'd say. As I said green is the order of the day here, even the bits that look a bit beige are in fact greenish if you look close enough. The main vehicle outer shell and part of the claw are in a lovely deep dark green with the exception of the widows which are painted on in blue. The next most dominant colour is the beige/green mentioned earlier which adorns most of the claw and the hubcaps and is a nice contrast to the dark green. Next we have a small amount of lighter pea green which only serves to highlight kibble in this mode and finally grey for the tyres. The detailing in this mode is great but could have been way better if he was bigger (I agree with Blitzwing in that he should have been a voyager). There is everything here from the bolts on the panels to the windscreen wipers, as well as grills, tyre treads, ladders, pneumatics, a little round thing on his bonnet and a sticker of a bulldog with big teeth (woof). In this mode the claw is slung over the roof ready to smash things off the road (or as he's in the jungle 'trees off the path) or god forbid some mine clearing. The claw is slightly wider in parts in order to make room for the gears that operate it but this doesn�t take anything away from the toy. Overall this mode is just lovely but in a menacing Decepticon kinda way of course, just don�t turn it upside down. 3 new colours appear in this mode, baby blue (apparently on all of the all spark power toys) here and there, silver for knee caps, crotch, torso and face and a dab of orange for his eyes, this of course means no light piping which is a shame. 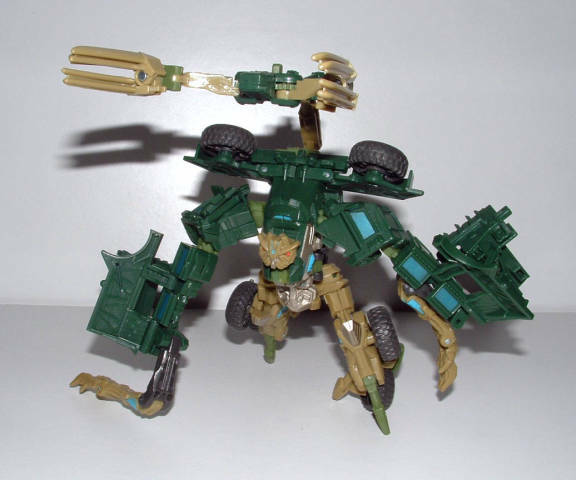 Jungle Bonecrusher is without any automorph feature but this doesn�t knock off points for the guy, I just think that maybe it would be there if he was a voyager. This mode is very menacing with a massive claw on his back, long slashy fingers and scary, footless insectoid legs you can really tell that he's a bad guy. He looks even more imposing with his arms fully extended, his crushing claw over his shoulders and his neck jutting violently forward, the stuff of bad nightmares but good toys. The feet (or rather the lack of them) is very intriguing indeed. 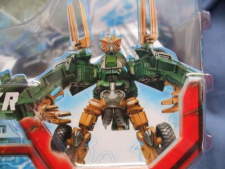 He instead has four insect like prongs surrounding his wheels and is a nice way to hide them in robot mode. Most of the vehicle parts are situated on the upper body with the exception of the four rear wheels. The vehicle parts aren�t even that visible (blue windows aside) unless you turn him around and even then it's just the bonnet and front wheels which by no means spoils it. Overall this mode is a win even without automorph or a projectile weapon but would have greatly benefited from a voyager class release, but hey, I'm happy with a deluxe this good. Transformation: 6- Easy to get the hang of but not too simple. Durability: 9- Very sturdy indeed, Blitzwing says he can manage 5ft and I believe him. Fun: 9- Fun indeed but small. Price: 8- �10/$20 is normal for the UK but I still think we should be able to get them cheaper. 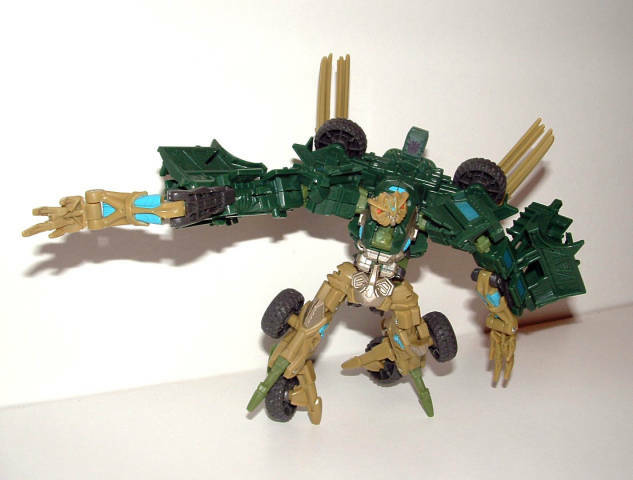 Overall: 9- I'd get him even if I had the original, which is more than I can say for some repaints. A definite must in any colour.